This entry was posted on Wednesday, October 10th, 2007 at 2:33 pm	and is filed under Software. You can follow any responses to this entry through the RSS 2.0 feed. Responses are currently closed, but you can trackback from your own site. So I guess is about some important features lacking in the current GTK+ print dialog. Oh, GIMP actually ships with a GTK+ print dialog! I didn’t realise that because Fedora disables it. 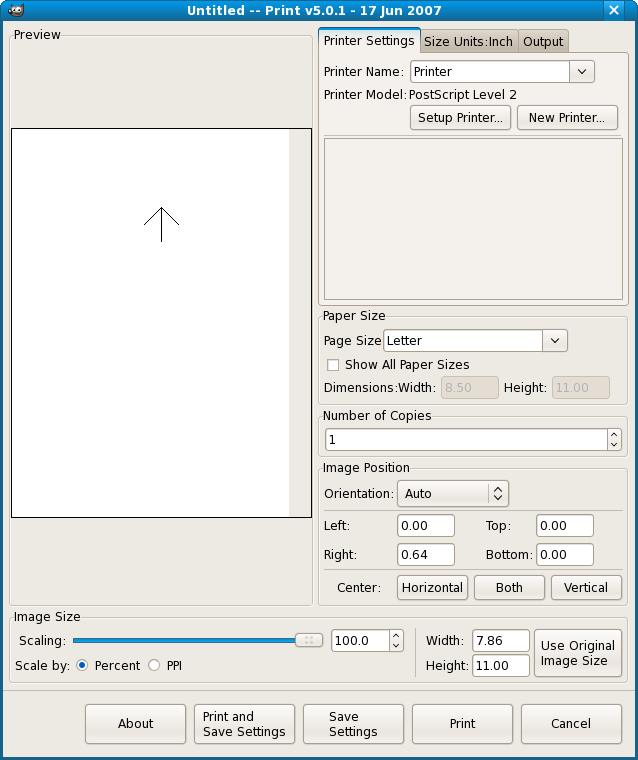 I spoke with Nils about this today and he will be building a package for Fedora 8 that includes the GTK+ print dialog as File->Print… (yay!). Just installed Gimp 2.4.0 and I can only assume that the new print dialog is someone’s idea of a joke. It does not detect my two printers (so I have to enter lpr -Pcolour to tell it to print to the Epson, for example) and has no facility for reading in a ppd file to set margins etc. In addition, it does not remember anything between two invocations, so everything has to be set up again each and every time, including typing the name of the printer! No, the GTK one. I’d LIKE to see the gutenprint/gimp-print one. I’ve been told I can use it as a plug in; I’ve not got that working yet but I’m looking into it. The problem was that Gentoo had the recent versions of Gutenprint which support 2.4 marked as unstable. Allowing their use installed the proper print dialog. I found out why you’re only seeing LPR in your print dialog instead of a list of printers. Your gtk+ libs aren’t cups-enabled. If you’re using gentoo, re-emerge gtk+ and make sure the cups USE flag is set. My print dialog went from Print-> LPR to Print -> could pick any of my printers. Too bad those of us who don’t care for the overhead of CUPS are now screwed, huh? No more direct printing to lpr for me! Eh? If you don’t want to run a CUPS server on the local machine, just create a /etc/cups/client.conf containing “ServerName my-server” for the CUPS server on the network.